If it is possible that the .NET Standard builds of OrmLite and OrmLite.SqlServer could run on the .NET Framework that would be helpful for me. Whether it runs on .NET Framework will still be dependent on the external NuGet packages if any, I'm assuming Microsoft packages will support it and PostgreSQL + MySqlConnector use the same NuGet package so there's a good chance they'll support it as well. These packages are available from v5.0.1 that's now available on MyGet. Is it possible to add this packages too? This would allow us to get rid of creating own packages and would also provide a full option to use AspCore + SS.Core with .Net Framework. This still doesn't mean you can run .NET Standard of ServiceStack on .NET Framework, that's not supported. These packages are only if your shared libraries needs to reference types in the server libraries. MVC shouldn't be referenced by shared libraries, but I've just added ServiceStack.Aws.Core which is now available on MyGet as well. Thanks - now we are back again on official packages - but I had to create my custom RazorFormat as it's located in ServiceStack.Mvc . Still not got the point "that's not supported" as the package ServiceStack.Mvc contains netstandard bits . Is it a license issue - so no official support? We basically not using .NET Standard of ServiceStack on .NET Framework, we use .NET Standard of ServiceStack with .NET Standard. All "Hosts" are using the same BaseLib.Hosting and some of them are just running on .net471 (but still with AspCore - so nothing changes and everything is done the same way), instead of netcoreapp, with references to external .NET Framework libs. Maybe it's really not typical use-case but it would be really helpful to have ServiceStack.Mvc.Core, too. This is a hard limitation from consolidating the .NET Core version into the main ServiceStack NuGet packages since installing the ServiceStack NuGet package in a .NET Framework project will always bring the .NET Framework version of ServiceStack which can only run on ASP.NET or HttpListener Self Hosts. Our goal with .NET Core was to make it as easy as possible to port from .NET Framework to .NET Core by maximizing source code compatibility. This means it's not possible for Customers who want to move their libraries to .NET Standard 2.0 builds but still run on the classic ASP.NET Framework because the .NET Standard 2.0 does not include ASP.NET Framework classes so the .NET Standard build of ServiceStack cannot run on the classic ASP.NET Framework. We also didn't expect running a .NET Core App on the .NET Framework to be a popular use-case so after we consolidated the .NET Core builds into the main ServiceStack NuGet packages we deprecated the .Core packages as everyone running ServiceStack on .NET Core should now be using the main NuGet packages. We'll make these new templates available in the dotnet-new templating tool tomorrow. I'd also want to make clear that support for running .NET Core Apps on .NET Framework are subject to the .NET Standard builds of external NuGet package dependencies also supporting running on .NET Framework. MyContracts is a class library I distribute and is a .NET Standard project so that those who consume it can do so in .NET Framework or .NET Core projects. In MyContracts, I use ServiceStack Interfaces. Am I supposed to change the OrmLite reference in MyEndpoint (a .NET Framework project) to be the .Core version? After spending the last hour converting all 20 projects ServiceStack references to .Core versions (very odd that I use the .Core version for the Framework projects), I am 'almost' out of the woods; 19 of the 20 project run correctly now. I need to expand the example above now to explain the problem. @mythz - what to do? You still can’t access .NET Framework specific functionality in .NET Standard builds. 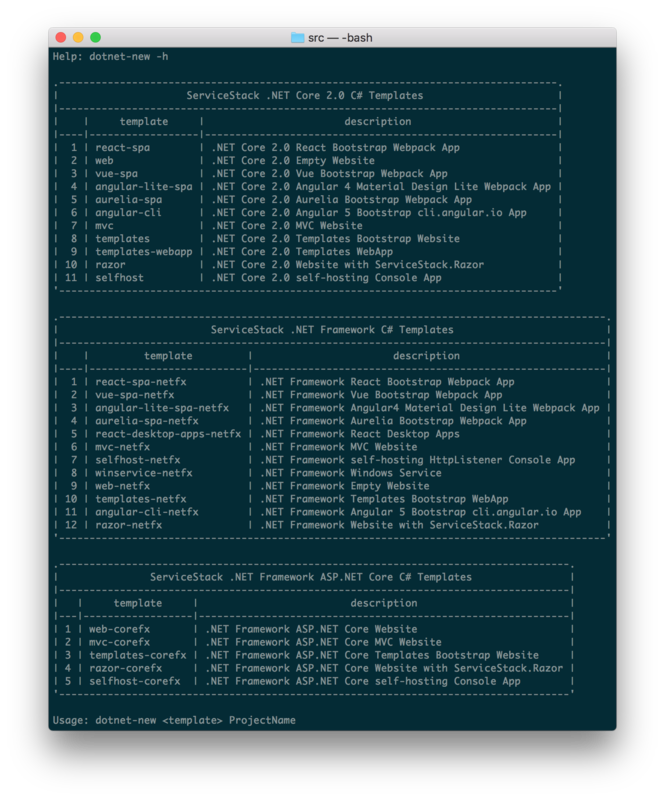 Please checkout the Hello Mobile multiple Server AppHosts for a reference example of sharing the same multi targeted projects between multiple AppHosts. Please just take a minute to read the issue here - I understand you feel like you've explained this enough already. I have read through everything above, plus the posts you linked to. Per the guidance you gave above - I followed the supported option of converting every reference to .Core in all of my Framework projects. That has left me with the issue I described above. Your .Core version of ServiceStack.Host doesn't have an AspNet or AspNewRequest object. As such, how do I support the above ExcludeRequestDtoType in my declaration of the RequestLogsFeature in my Asp.Net Framework project? You still can’t access .NET Framework specific functionality in .NET Standard builds. Only the .NET v4.5 builds contains support for hosting on classic ASP.NET Hosts (i.e. AspNetRequest/AspNetResponse). You cannot use .NET Standard builds on ServiceStack in classic ASP.NET Web projects, the build does not physically contain the dependencies and functionality for it - this is simply not available in .NET Standard 2.0 (which only covers running ASP.NET Core Apps). So if you need to share any dependencies/projects from a classic ASP.NET Web project with .NET Standard or .NET Core targets you need to multi-target. Please checkout the Hello Mobile multiple Server AppHosts for a reference example of sharing the same multi targeted projects between multiple AppHosts. If you want to host on Classic ASP.NET you must multi-target. If you're hosting on ASP.NET Core you can also use and share .Core projects with v4.6.1+ and .NET Core projects provided you don't need any .NET Framework specific functionality, like the old classic ASP.NET Web HttpRequest/HttpResponse/HttpContext classes.